An Account Of The Middle: Read Or Flunk! Remember me saying I purchased the Vampire Academy series from eBay? 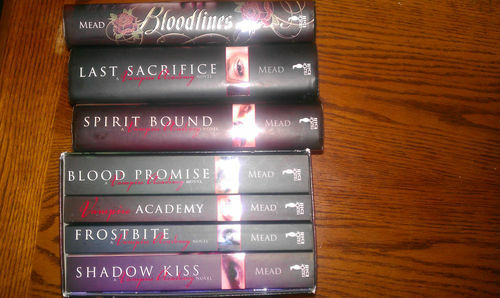 I received that shipment last Tuesday, all six books plus a bonus book, Bloodlines. But it was Tuesday, and therefore M and I had an appointment with an auction. No bloodsucker book reading for me, I had junk to search through treasures to search for. One week later I have yet to actually pick up a book and start to read. L, however, is now on the forth book in the series. Yes, I know! He's smokin' me! He and the Girls are now discussing plots and characters and cliff hangers and possible alternate endings...and now they stop talking when I enter the room. The Girls are taking this very seriously. Apparently there's going to be a Vampire Academy pre-movie test; and since I'm not allowed to hear the Vampire Academy verbal study guide forum, it would seem that the only way I'm going to pass that test is to open read the book...s.